Spring-dug Parsnips! During the long cold winter, parsnips pump themselves full of sugars (which act as a natural antifreeze) to prevent their cells from freezing. Overwintered parsnips are candy-sweet. Sunchokes! Also called Jerusalem artichokes and earth apples, these little nuggets are the tubers of a flowering plant (Helianthus tuberosos) related to sunflowers. They’re sweet and earthy, low in starch, and rich in inulin. Have a favorite recipe of your own? Share it with your fellow Winter CSA members! If you’ve got a favorite recipe you’d like to share, submit your recipe here! By now you’ve probably got plenty of parsnip ideas. These super-sweet overwintered parsnips are best prepared simply, to allow their natural candy-sweetness to shine. Roast at 350 for 30-45 minutes until soft, tender, and slightly caramelized. To prevent drying out, it helps to cover with foil for the first 15-20 minutes. For more recipes including baked parsnip fries with rosemary, root vegetable tarte tatin, and spicy honey-glazed parsnips, click here. Sunchokes sweet, earthy, nutty flavor is simply and wonderfully showcased in roasting. Pair with roasted potatoes and celeriac, mushrooms, or add to a roasted chicken. Roast at 350 until tender and slightly golden in color. Slice 1 lb sunchokes into ¼ inch thick rounds and grate ½ cup Gruyere cheese. Bring 1 cup milk & 1 cup water to boil. Add sunchoke slices, reduce heat to simmer, and cook until tender but still firm (about 8 minutes). Drain, and arrange in a buttered baking dish. Cool in pan on a rack for 10 minutes, then turn over and remove parchment paper. Cool completely before frosting. Another similar cake calls for brown butter frosting. Thanks Shirley for sharing your recipe! This week, we are providing you with nearly all of the ingredients you’ll need to try your hand at simple, safe fermentation: try your hand at sauerkraut, kimchi, or “kraut-chi”, a creative combination of the two! Simply put, fermentation “cooks” the food, making certain nutrients more available to us and adding/changing the probiotic character of the food, using microbes instead of heat. Yogurt, bread, beer, wine, sake, cheese, meat and pickles are all products of fermentation. Fermentation is a great way to add vibrant flavors and textures to your plate (without the addition of fats or processed seasonings), get creative in the kitchen, and diversify gut bacteria to aid in digestion. If you’ve never made your own sauerkraut or kimchi before, we hope this week you’ll consider giving it a try. Have a favorite recipe of your own? Share it with your fellow Winter CSA members! If you’ve got a favorite recipe you’d like to share, submit your recipe here ! For those of you who won’t be trying your hand at fermentation this week, we suggest this Parsnip and Celeriac Soup: a sweet-and-savory winter soup with a creamy potato base. Making sauerkraut, while it may seem intimidating at first, is really something anyone can do! Put simply, you’re using a salty brine solution to keep out the “bad guys” and allow the “good guys” (the microbes that occur naturally on the cabbage) to work their magic. Remove the outer two leaves and clean off any damaged, discolored or otherwise bad-looking spots. Reserve one whole leaf for later. Using a mandoline or a sharp clean knife and a clean cutting board, slice your cabbage very thinly into a big (clean) bowl. Sprinkle in some salt . Be sure to use non-iodized, also “canning” or “pickling” salt. You’ll want 1.5-2 tsp per pound of cabbage. Massage salt into cabbage with clean hands until it starts to release liquid. This is your brine. IF MAKING KRAUT-CHI, follow additional steps below. Pack cabbage and brine into a clean (sterilized) glass jar, ideally one that has just come out of a dishwasher or been washed thoroughly and swirled with boiling water. Massage a pinch of salt into that whole cabbage leaf you saved at the beginning, and fit it down over the sliced cabbage like a cap . Use a smaller jar filled with pebbles or some other heavy material to press and weight the kraut down: your goal is to keep the cabbage submerged below the liquid. Any chunks of cabbage sticking up in the air could begin to mold. If after 6 hours your cabbage hasn’t generated enough brine to cover itself, make a salt solution to supplement. Mix 1 heaping tablespoon salt with 2 cups boiling water, allow to cool fully (this is important, as you don’t want to cook your microbes! ), and pour over kraut. Now, wait. Let it sit. In 1-2 days you’ll see bubbles forming, and can press down on the weight to “burp” your kraut if the brine is in danger of overflowing. It should stop bubbling in 2-5 days. Start tasting after a week. The longer you leave it out, the more sour it will get. You can start eating it at any time it tastes good to you. If you want to slow/stop the fermentation, put a lid on it and place it in the refrigerator. Note: Some processes call for salting your cabbage, letting it sit, draining it, rinsing it, and then proceeding with the following steps. For the sake of simplicity, we’ve omitted those steps here. Add any/all of the following: Chinese cabbage or bok choy (thinly sliced), daikon or other radish (thinly sliced/shredded/julienned), scarlet turnip or carrot (thinly sliced/shredded/julienned), green onions/scallions (chopped), garlic and ginger (finely chopped), gochugaru (or some red pepper flakes or finely chopped fresh hot pepper), and/or seaweed flakes or fish sauce (optional). A more complicated process calls for making a paste out of the garlic, ginger, green onion, chili/gochugaru, fish sauce, and some of the vegetable brine, and stirring this into the sliced cabbage/radish/carrot mixture. This gives kimchi its distinctive reddish color. Make your own, or you can purchase kimchi paste from any number of sources. To make straight-up kimchi, which traditionally includes the draining process and paste-making, check out ”How To Make Easy Kimchi At Home” from The Kitchn . Fermenting vegetables is a very safe, low-risk endeavor. Sandor Katz, the guru of Fermentation (and author of Wild Fermentation and The Art of Fermentation), asserts that, according to the USDA, there has never been single documented case of food poisoning from fermented vegetables. That said, here are some tips regarding cleanliness and safety. Cleanliness is key! Make sure all materials (knives, cutting boards, jars, hands) are clean and/or sanitized with hot water or vinegar. There are ample online resources that provide information on best practices with regards to safety. Smell: A funky, stinky-but-yummy fermented smell is good! Bad bacteria will smell… well, bad. Trust your nose, which should tell you if something is off. Mold: Any material not submerged in the protective brine could start to mold. If you see any mold, just pull these pieces out, or skim off the top until what’s left looks fine. A little mold on top shouldn’t compromise the kraut that’s submerged. Sliminess: Slime is bad! The kraut should have firm texture, and the brine should stay thin, like salty water. If anything gets slimy (and smelly), compost it and start again. This week, we are featuring one of our less familiar, more mysterious root vegetables: the Black Spanish Radish. Here are some notes on this vegetable, including preparation tips and recipe suggestions. 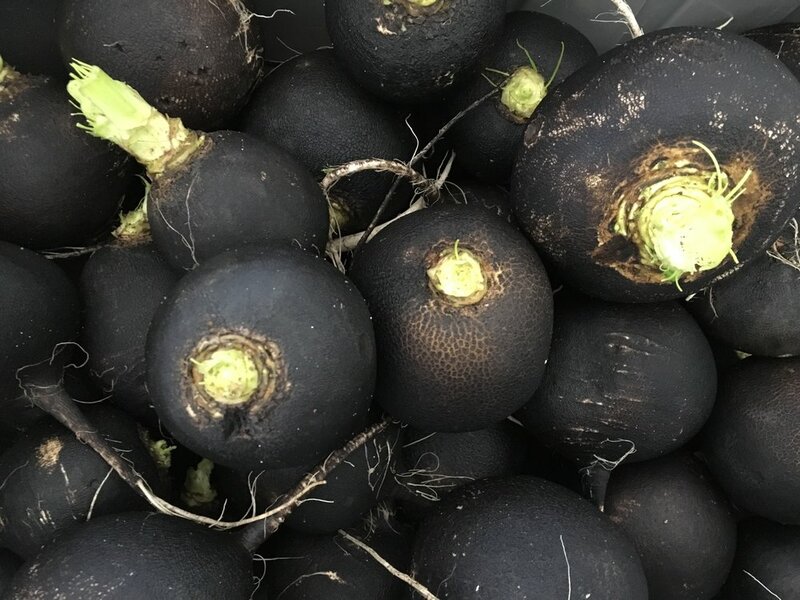 The Black Spanish Radish (Raphanus sativus niger), otherwise known as the “Black Mooli”, is a uniquely beautiful root vegetable with a robust flavor and fascinating history. The textured, matte-black exterior of the Black Spanish gives way to a smooth, bright cream-colored interior that is high in Vitamin C. The meat of this radish is firm, yet also tender: this a toothsome, almost velvety radish -- not a crisp, juicy winter radish like the watermelon or daikon. It has been used by the Europeans, the Chinese, and the Ancient Egyptians as a medicinal vegetable to promote the health of everything from the gallbladder and the liver to the pulmonary and respiratory systems. This radish is known for its ability to help fight off infections, and to promote a healthy digestive system. Adding cubed celeriac and thick-sliced orange carrot to the pan creates a deliciously full-flavored winter roasted vegetable mix that is both savory and sweet. Adding Black Spanish radish cubes to the bottom of a pan of roasting chicken (and allowing the radish to cook in the juices) elevates the complex and savory notes of this vegetable. Enjoy roasted Black Spanish radish as a side, or mixed with rice. Or try making them into chips! Slice thinly (into ¼ or ⅛ inch rounds), oil well, salt, and bake at 400 degrees until crispy (but not burnt). Watch these carefully as the time between perfect and burnt is very narrow. You can also follow this recipe. For more recipe ideas, consider making them into soup or check out Cathy Erway’s article, Three Ways To Cook One Tough Radish. Happy eating, and stay tuned for more recipes for the 2/17 distribution! February’s Harvest of the Month is onions. 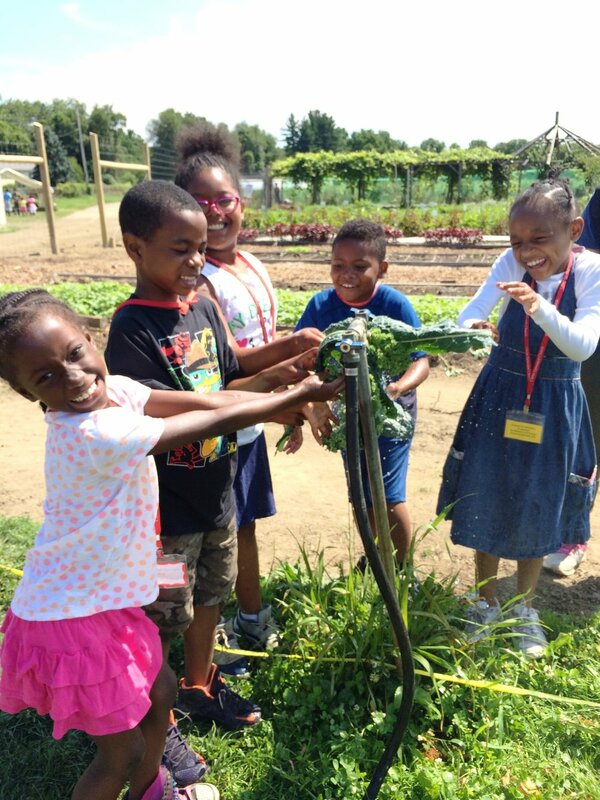 Harvest of the Month is an initiative of Poughkeepsie Farm Project’s Farm to School program. A different local farm product is served in school meals at area schools each month and we are helping to promote these locally available farm products. Onions are an ancient crop that has been grown by civilizations for at least 5,000 years. The onion is part of the genus Allium and is related to other popular vegetables including garlic, shallots, leeks, and chives. There are over 300 different varieties of onions that vary in shape, size, taste, and smell making this vegetable a versatile addition to almost any dish. Did you know that onions are the third most popular vegetable in the United States? As a nation, we ate around 7.7 pounds of onions per person in 2015. That’s a lot of onions! And it is no wonder that we love onions so much when you consider the sweet and savory flavors that they bring to a dish. However, an onion is so much more than just a delicious addition to any meal. Onions are also high in vitamin C and fiber, and have only 45 calories per serving. This means that onions can add tons of flavor to a meal without the additional fat and calories. Onions are also rich in the antioxidant, quercetin. This is a powerful antioxidant that helps protect our bodies from free radical damage. Research suggests that quercetin may help protect against diseases including cancer and heart disease. Having trouble cutting your onions through all the tears? Slicing onions makes us cry because of the release of sulfuric acids from the cut onion. These gases are a natural defense mechanism of the onion used to ward if hungry pests in nature. When sulfuric acid interacts with the moisture in our eyes, it results in tears. One way to avoid this reaction is to chill the onion in the refrigerator before cutting into it. Another solution is to slice the onion under running water or while the onion is submerged in water. These approaches will lessen the release of sulfuric acid. No more tears! Fun fact: Onions held a sacred place in the ancient Egyptian culture. Ancient Egyptians believed that the many concentric layers of the onion represented eternity. In fact, archaeologists have found evidence of onions being placed in the tombs of pharaohs because they were believed to bring luck in the afterlife. Here at PFP, we grow a variety of both yellow and red onions. We start our onions in the greenhouse around the first week of March and transplant them to the fields at the end of April. Onions are harvested in the months of July and August, cured (the process where the outer layers are dried out into the papery layers), and then stored for use throughout the fall and winter months. The onions we are eating now are actually from this August’s harvest! One of our favorite ways to enjoy onions is to caramelize them. Here at PFP we think that caramelized onions make a flavorful addition to almost any dish. Caramelizing or “browning” the onions takes away the sharp, raw flavor of the onions and replaces it with a savory, sweet taste. All you need for this recipe is onions, a knife and frying pan, oil (we prefer olive oil for heart health), and salt to taste. No added sugar necessary! The secret to great caramelized onions is to cook them slowly over low heat. Remember low and slow is the way to go! Begin by washing your hands and all equipment. Thinly slice onions, making sure to separate the layers. You can make the onions as thin as you would like. Heat the olive oil over low heat. Once the oil is hot, add the sliced onions and cook uncovered on low heat for 45 minutes, stirring occasionally. Adjust the heat as needed so that the onions don’t burn. Finally, add salt to taste. Try adding caramelized onions to sandwiches, salads, and sides for a flavorful addition! This week, you may see some less-familiar crops in your share. Featured vegetables for this distribution are celeriac, kohlrabi, rutabaga, Black Spanish and watermelon radishes, Bok Choy and Tokyo Bekana. We’ve pulled together some preparation ideas, as well as links to some of our farmer-favorite and staff-pics recipes. German’s pick is Mashed Rutabaga, a simple mash of soft-boiled rutabaga with butter, sugar and salt. Reserve the cooking liquid as a base for a pureed squash soup with coconut oil and red curry paste, or add a touch of sweetness to a potato leek soup. Lauren’s pick is this Celeriac Apple Slaw. Quick and easy with lively sweet flavors, this raw recipe is a great way to enjoy some fresh winter crunch. LK can’t choose between Kohlrabi Fritters from Early Morning Farm (to which she highly recommends adding some grated Pecorino or Romano cheese and black pepper) and this Root Vegetable Gratin from Smitten Kitchen: a great way to marry your celeriac, rutabaga, potatoes and sweet potatoes into a heavenly, hearty dish perfect for these freezing temperatures. Zoe’s pick is Japanese Cabbage Rolls, for which you can use regular cabbage or Tokyo Bekana leaves. Enjoy as-is or serve with rice, quick-pickled radishes and carrots, and a bit of sriracha or chili oil. shred, squeeze excess water, mix with egg, flour, onion and garlic powder and grated Romano or Parmesean cheese, and fry into these little fritters. Tune in next distribution (February 3) for some suggestions with what to do with all of your winter radishes! 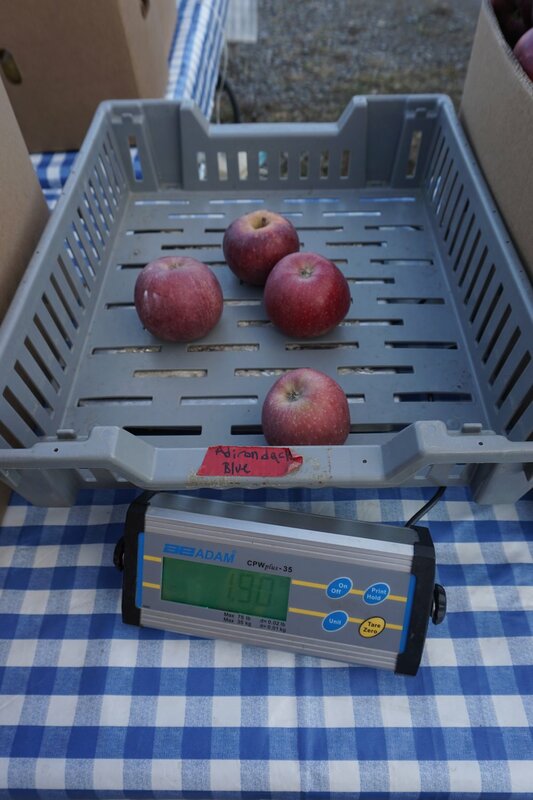 January’s Harvest of the Month is apples. Harvest of the Month is an initiative of Poughkeepsie Farm Project’s Farm to School program. A different local farm product is served in school meals at area schools every month and we are helping to promote these locally available farm products. An apple a day keeps the doctor away. A ½ cup of sliced apples is an easy way to add fiber to your diet everyday. Pro tip: apples are best when eaten with the peel, as that is where most of the fiber and antioxidants are found. A ½ cup of apples a day may sound like a lot but, one of the amazing things about apples is that they can be eaten in a variety of ways - as whole (fresh!) apples, unsweetened applesauce, dried apples, or in my personal favorite: apple pie. At PFP, the apples we distribute through our fruit share during the regular CSA season come from Glorie Farm in Marlboro. 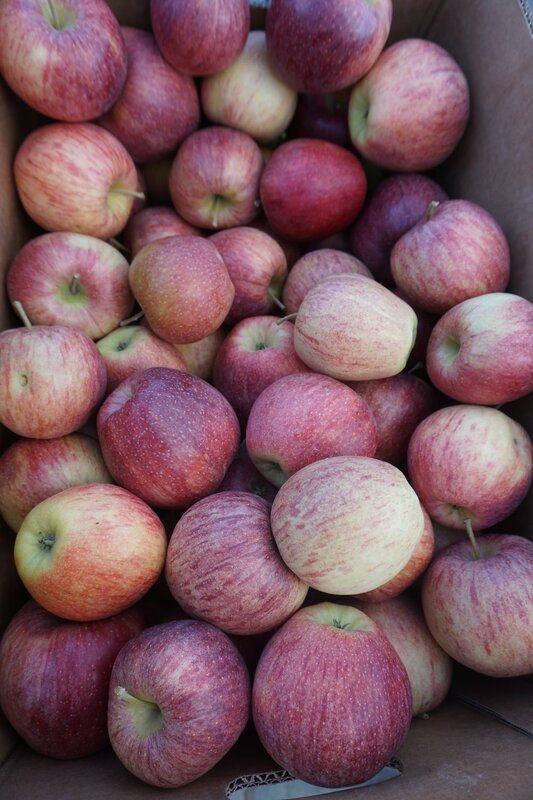 Their low-spray apples (and other fruits) also make their way to our educational programs. 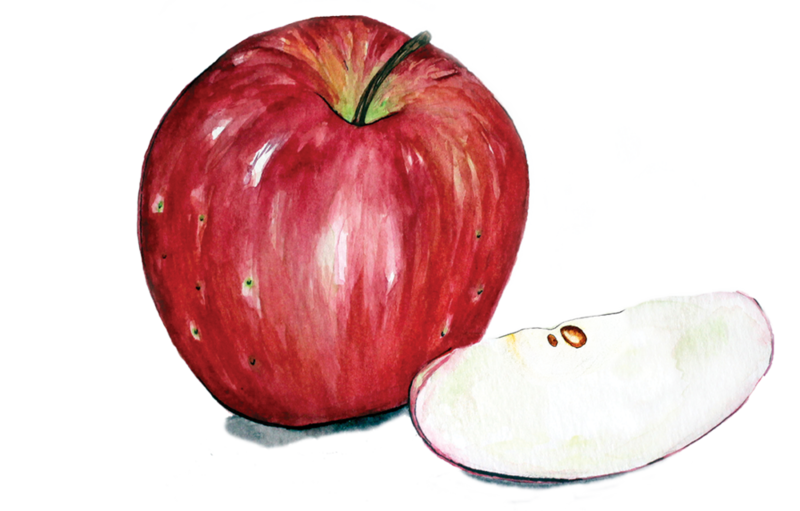 Not only are apples good for you, they are a great educational tool for kids. 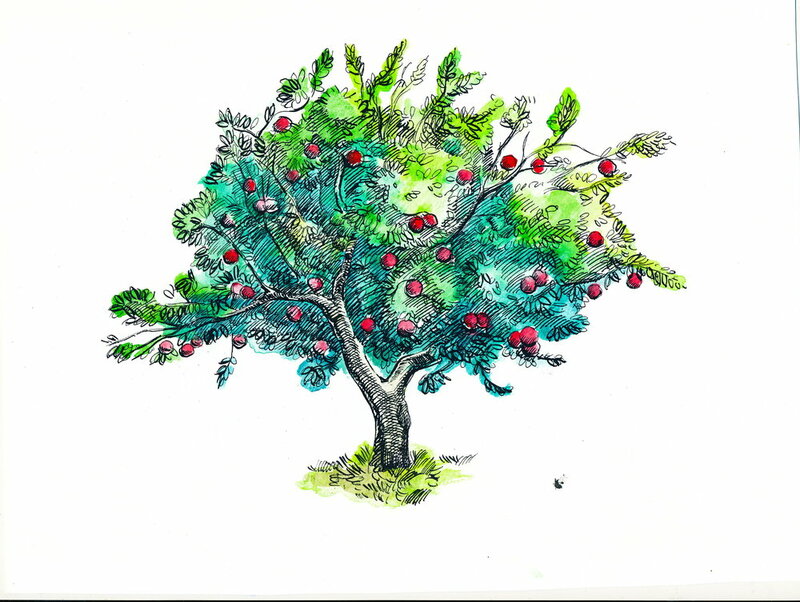 We like to use apples to teach students about pollination, the plant life cycle, and how trees produce the fruits we love to eat. 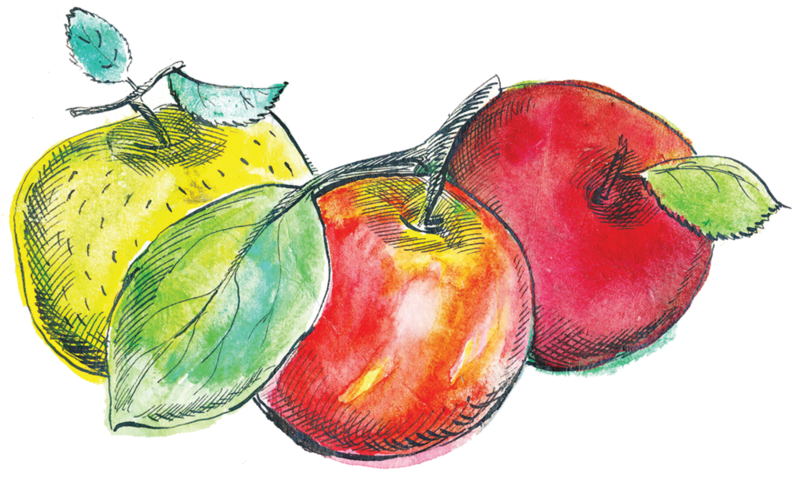 Apples are also also a great addition to many vegetable recipes we use in our cooking workshops from smoothies to salads. Fun fact: Domestic or table apples are of the species Malus pumila and are one of the most widely cultivated tree fruits across the world. There are over 7,000 varieties of apples (that’s a lot of apple pie) the oldest originating from the mountains of Central Asia. Apples were first introduced to the U.S by European settlers during 1600s to share their cultivation and traditions. We can’t talk about North America’s history with apples without mentioning one of our fondest folk heroes: Johnny Appleseed. Johnny Appleseed was a pioneer apple farmer in the 1800’s and his dream was to grow so many apples that no one would ever go hungry. Unlike most legends Johnny Appleseed was a real person named John Chapman. In his lifetime Chapman planted over 1200 acres of apple orchards. Contrary to common belief, Chapman’s apples wouldn’t be recognizable as the conventional apples we are accustomed to in the grocery store. Chapman grew apples that were very small and tart - nicknamed “spitters” because that’s probably what you would do if you took a bite out of one. However, “spitters” were perfect for hard cider and applejack which was valued more than edible apples. Fun Fact: until the 1920s, most apples in the U.S were used for making cider. Especially in rural areas, cider replaced water because the water often wasn’t safe to drink. The cider they were drinking was what we would not call hard cider. In the spirit of the true story of Johnny appleseed here is an easy apple cider recipe. This cider may not be what Johnny Appleseed used to drink but it’s non-alcoholic and quick to make and enjoy with kids. All you need is about 6 cups of apple juice or enough to fill a large saucepan, ½ teaspoon whole cloves, ¼ teaspoon ground nutmeg and 3 cinnamon sticks. Place everything in the large saucepan and bring to boil over medium-high heat. Once it begins to boil reduce heat and let it simmer uncovered 10 minutes. Pro tip: Heating the mixture brings out the flavors of the spices. The longer you let cider simmer the more fragrant it will become. Harvest of the Month: Nosh on Squash! December’s Harvest of the Month is Winter Squash. Winter squash are an annual vegetable that signals the end of our summer/spring crops: the tomatoes, cucumbers, eggplants, and okra, and welcomes the beginning of our lovely fall greens and winter roots. You can distinguish winter squash from summer squash because winter squash is harvested and eaten in the mature fruit stage meaning the seeds have aged and the skin has hardened into a tough rind which makes it the perfect winter crop. Luckily, for us the winter squash family comes in many different colors, shapes and sizes from a vivid yellow, watermelon-shaped spaghetti squash to a bright orange, round pumpkin that Charlie Brown would approve of. Pumpkins, acorn or butternut squash have become symbols for the changing seasons. You know fall hasn’t officially started yet until you’ve had your first pumpkin spice latte. However, there’s much more to pumpkins and winter squashes than fall-themed lattes. Winter squash are great sources of beta-carotene which will help your immune system stay healthy and fortified to fight off any colds that may be headed your way this flu season. Pro tip: beta-carotenes are found in red-orange colored food. Pick a squash with dark coloring. The darker the orange flesh, the more nutritious the squash is. Fun fact: squash got its name from the Native American word askutasquash, (try saying that three times fast) which means “a green thing eaten raw.” Now, I wouldn’t recommend eating your winter squash raw. However, winter squash very is delicious when it’s roasted. Roasted squash is very tender and roasting brings out it’s natural sugars so it’s very sweet. At Poughkeepsie Farm Project (PFP) we grow several different varieties of winter squash including butternut, delicata, acorn, spaghetti squash. The farm crew’s favorite squash is delicate because it is easy to cut into rings and roast; it is delicious and you don’t even have to peel it because the skin becomes tender when you roast it. One of our favorite ways to prepare winter squash is roasted butternut squash with children is by making it into hummus. Our butternut squash hummus is an easy recipe and fun to make with kids. In fact, it’s a fan favorite in many of our elementary school cooking workshops. This recipe doesn’t have exact measurements it all depends on how much you want to make and how you like your hummus. We like to tell our students that every time we make our butternut squash hummus, it’s special because it will be a little different each time. Beforehand, roast the butternut squash until tender. Once cooled scoop the squash into a big bowl. The base of the hummus is roasted butternut squash, chickpeas and a dash of olive oil. The more chickpeas you add the thicker the hummus will be. You can add spices and seasonings for flavor such as paprika, tahini, garlic powder and lemon juice. Now, you can throw everything into the food processor or you can blend it the old-fashioned way which we prefer with a potato masher. You can pass the bowl around and give everyone a turn with the masher. Once the ingredients are blended together, the hummus pairs well with carrots or tortilla chips. Even though winter is coming, we’ve got you covered! Sign up for a winter CSA share for PFP-grown butternut squash (and other tasty produce!) throughout the cold season. 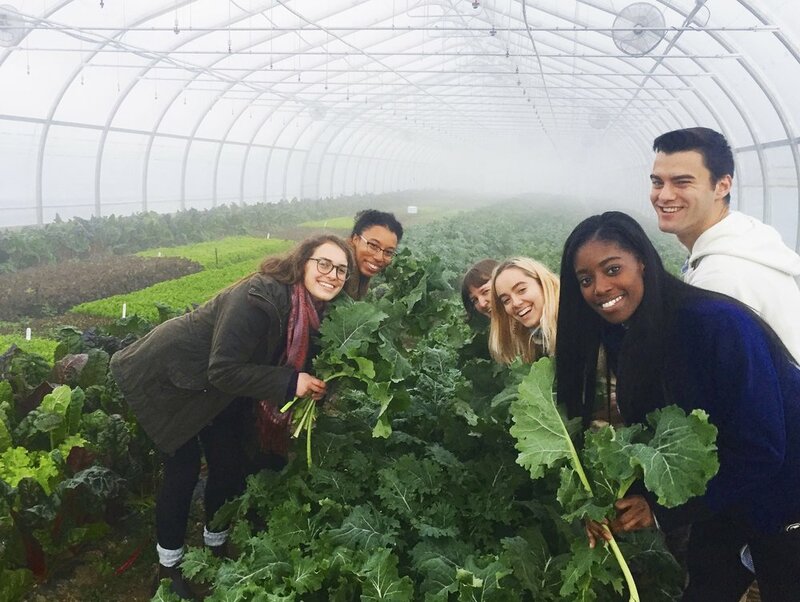 Alyssa and Rodnisha glean kale for Feeding the Hudson Valley. Kale is a leafy green from the Brassica family that has been cultivated since ancient Greek and Roman times. Kale is known for being a hardy crop that is easy to grow and can withstand low temperatures. It’s the perfect vegetable for a beginner gardener to grow especially in cold New York winters. In fact, kale is sometimes nicknamed the “hungry gap” because some varieties can grow in the winter when most crops can’t be harvested. You may be wondering what makes kale different from lettuce or collard greens. Well, kale is actually the sweeter cousin of collards and can take on many different flavors ranging from slightly sweet to somewhat bitter depending on when it is harvested. During the cooler months of spring and early summer, kale is milder. When the weather starts to get warmer kale develops a bitter taste. Pro tip: if you like sweet kale, wait to harvest your kale until after the first fall frost; that’s when it’s the most delicious. 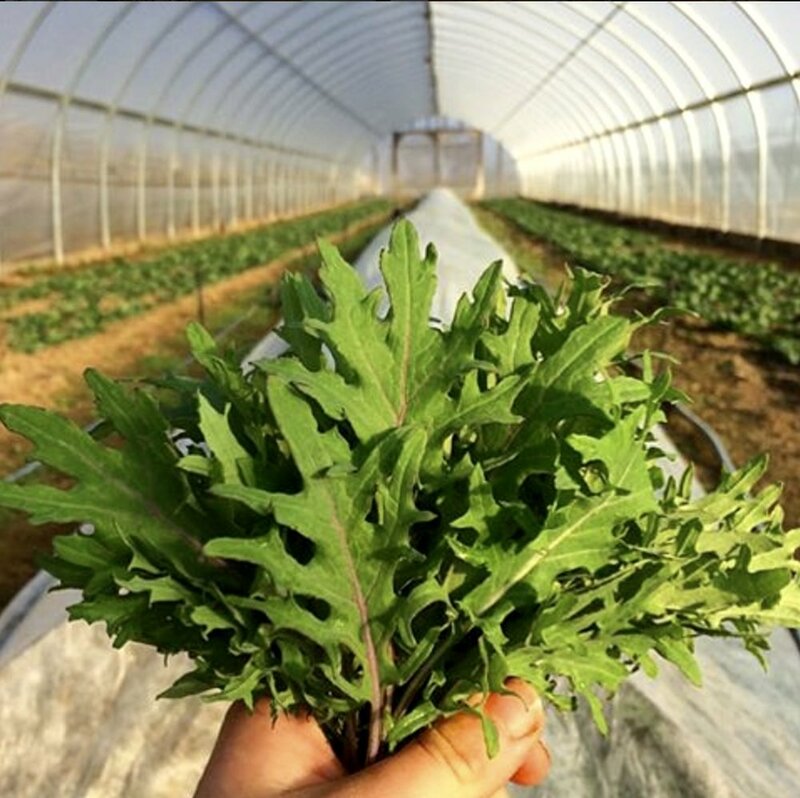 At Poughkeepsie Farm Project (PFP) we grow kale year-round. There are three different types of kale that call PFP home: Winterbor, Lacinato and Scarlet. Winterbor is very robust kale which has finely curled, thick, blue-green leaves. Lacinato, also known as dinosaur kale, has long leaves that people say resemble rough and bumpy dinosaur skin. Last but not least, Scarlet kale has beautiful, purple-red, curly leaves that will add beautiful color to any garden or salad. We love growing kale because it’s easy to grow and easy to eat but what we love most about kale is sharing it. PFP harvests about 4,000 pounds of kale each year and we donate over 400 pounds to emergency food providers in the Poughkeepsie community. Kale is packed with many essential vitamins and nutrients such as Vitamin A, Vitamin C, and Omega fatty acids. Fun fact: one cup of cooked kale contains 10 percent of daily fiber needs. This leafy green can be helpful for those managing diabetes as well! Also, we recommend preparing kale with your little one so they have time to become more familiar with kale and they will be more likely to eat something they helped make. 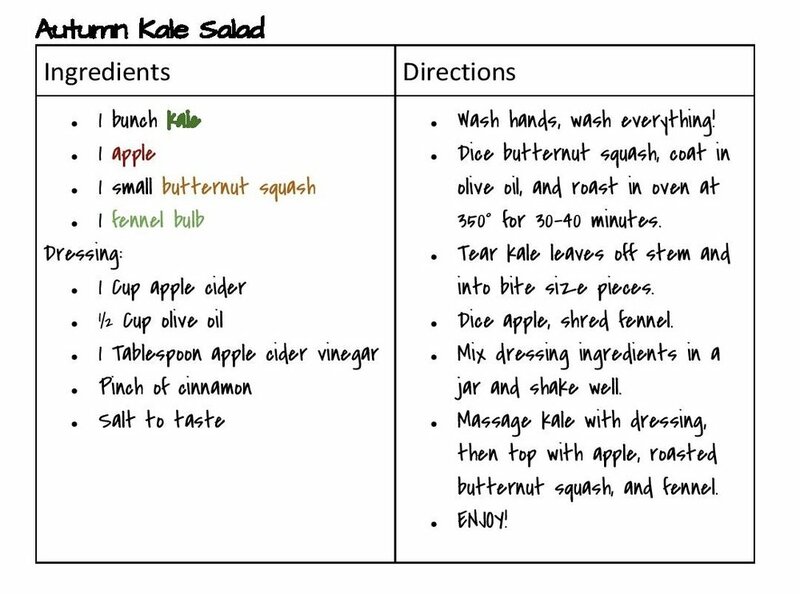 An easy and tasty way to prepare kale with children is a kale salad. Apples or berries make a nice addition to a kale salad because they help sweeten the bitterness of the kale. You can use raw kale which will make a really crunchy salad or you could lightly sauté the kale which may help sweeten it. We like to massage the raw kale with some olive oil and salt to tenderize it. Then we add our toppings and some apple cider or balsamic vinegar. Whichever salad dressing you normally use at home: ranch, Italian, Cesar, etc. would also work. Students on a field trip to PFP explain how they made the kale blueberry salad they are enjoying.